The trenches of Leinster House are packed with jittery soldiers. It's akin to the 'Phoney' part of World War II, when everyone was waiting for the rumble of German tanks. In fairness, the election hysteria which gripped the Bubble last week (thanks to some masterly wielding of the big brown spoon by broadcaster Ivan Yates), was less in evidence in the corridors yesterday. But it still feels like an election is imminent. On the morning airwaves, Renua's Lucinda Creighton tangled with Sinn Féin's financial spokesman Pearse Doherty over their parties' respective economic policies/manifestos. (Renua launched its pre-budget submission on Monday, Sinn Féin is publishing its one tomorrow). The latter's well-drilled ground troops were promptly busy on social media. "Wow, how can you be to the right of the PDs, whose reckless Thatcherite policies bankrupted our economy?" Pádraig Mac Lochlainn tweeted. And there was still a low-key hum about the place. Deputies of both genders were sporting suspiciously fresh hairdos, prompting the conclusion they're all spiffed up for the election poster photos. Moreover the Leinster House porters were unusually busy, lugging bales of photocopy paper to various offices. "There's an election coming, is there?" quipped one lad, flat-out with a trolley. Fianna Fáil's Mayo TD Dara Calleary is convinced that his constituency rival has a date in mind. "I think the Taoiseach has made his mind up. I've met him recently at a few constituency events, and he's happy out. The momentum that's built up now might end up bouncing him into an early election, whether he wants one or not," he reckoned. One insider believes that Fine Gael will put all sorts of polls into key constituencies in the immediate aftermath of the Budget. "They'll spend a weekend poring over the results, and then make a decision. Enda will head for the Park and then he'll hand Michael D his phone and say, 'Please ring Joan'. Because she won't want to know about an early election," he reckoned. A Government TD and an Independent deputy were having a quiet chat on the corridors during the afternoon. So are they both ready to rumble, if Enda pops up at the Park later this month? "As ready as I'll ever be," they both chirped simultaneously. Indeed, there was a lot of bravado in evidence. Fianna Fáil's Barry Cowen was in full 'Braveheart' mode. "Bring it on! I'm mad for it!" he declared feistily. United Left deputy Clare Daly was in a similar frame of mind. "They should call it soon; nothing's getting done any more around here," she argued. Some of the more experienced heads were exuding a sort of Zen calm. "I've been ready for ages," explained Fine Gael TD for Louth, Fergus O'Dowd. "It's simply that the campaign for the next election begins the day after the count for the last one". Nor is the Taoiseach calming jagged nerves; three times in the space of 24 hours (once on Monday and twice in the Dáil yesterday), he dodged opportunities to name the date. During the Order of Business, Micheál Martin tried an ambush, demanding to know if the extension of the Banking Inquiry meant that there'll be no election. "If the Dáil collapses, that inquiry collapses," he informed the Taoiseach. Enda ducked and dived like an Olympic synchronised swimmer before, after a bit of roaring from Micheál, he said soothingly: "The House is not going to collapse, don't worry," using the same tone of voice as a parent to a young child fretting about monsters under his bunk-bed. 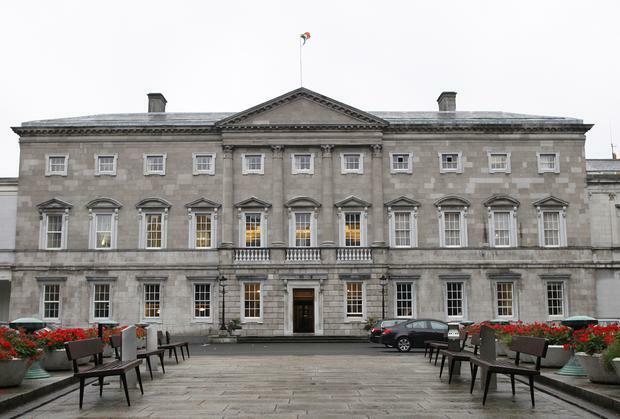 "He's referring to the ACTUAL house, as in Leinster House," interpreted one observer sagely. Golly. Well, there'll be long faces in Labour if Enda brings the House down before next year. However, Clare TD Michael McNamara isn't too despondent about a shake-up of the status quo. "I've a young dog at home and I could train him to come in and press the green button with his nose, for all the power and influence you have as a backbencher right now." Oh dear. That would give one paws for thought, indeed.